The Chesapeake Bay Maritime Museum in St. Michaels, Md. 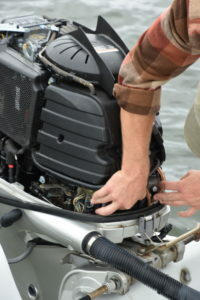 has two spring workshops to help boaters get their outboard engines ready for boating season. On Saturday, March 30, from 1:00 to 4:00 p.m., Recommissioning Your Outboard Motor will lead participants through checking the engine’s running condition and temperature, understanding ignition and starting systems, and learning how to replace the engine’s fuel filter. A second workshop, from 9:00 a.m. to noon on Saturday, April 27, has a limited number of participants bringing questions or their own outboard motors for assessment during CBMM’s Bring Your Own Motor workshop. Both workshops will be led by CBMM Marine Mechanic Josh Richardson, who has more than 15 years of experience working in marine mechanics, and is a graduate of the Marine Mechanics Institute of Orlando, Fla.
Recommissioning Your Outboard Motor is $45 per participant, and the Bring Your Own Motor workshop is $35 per participant, with a 20% discount for CBMM members for both workshops. Participation is limited, with registration taken at cbmm.org/outboardrecommission or cbmm.org/bringyourmotor.